For two decades Israel has been walking toward the gallows. Its leaders have led it there by empty international assurances. Its people have been led there by refusing to see what is waiting ahead for them, even while the blood was being cleaned off the streets. Every attempt to reach a peaceful solution, every concession and show of good faith, has only tightened the bonds around its hands and the noose around its neck. Every concession Israel has made, has further restricted not only its ability to defend itself, but even its ability to do basic things such as build residential housing in the capital of its own nation. Every gesture and agreement Israel has signed has bound it to ever more restrictive terms. And none of them have brought any peace. All they have ever done is set the bar higher for the next round of concessions demanded by the enemy and its aiders and abettors in the next phase of negotiations. The lynching began as a trial where the murderer wore a fine suit and his victim sat in an orange jumpsuit in the dock. Every day during the trial, the murderer would be allowed to leave the courtroom to kill again. And every afternoon he would return to the courtroom with bloody hands that the judge and jurors would pretend not to see. If the victim called attention to those bloody hands, he would be told that those murders were also his fault because he had provoked the murderer into committing them. The endgame is all too clear. The undoing of that "mistake" which allowed the oldest and most persecuted minority in the Middle East to briefly reclaim their homeland from the tyranny of Muslim Caliphs and Sultans as a homeland for their persecuted brethren from the east and the west. Every time Israel tries to be accommodating, it instead takes a step closer to the gallows. It allows the noose to be tightened around its neck. And every time that happens, it has to fight harder for air. Eventually there will be no air at all. Only a sad forlorn figure swinging in the hot eastern wind from the desert. And cries of Ibtach al Yahood among the rubble of cities and gardens of Jerusalem, Haifa, Tel Aviv and Ariel. Israel cannot survive by accommodating a lynch mob. Only by having the courage to defy it. When the international community at the behest of the Muslim lynch mob dictates the parameters of Israel's survival, it must expand those parameters by pushing through them to the other side. If they want to recognize terrorists, then kill those terrorists. If they want to unilaterally create a Palestinian state, then annex those territories. Accommodation is a noose. Defiance is the air of freedom. Every time Israel retreats, it is condemned for it. When it advances, it is condemned for it also, but its freedom of action expands. The world will always condemn Israel regardless of its intentions. But like any form of name-calling, those condemnations only gain power when Israel allows its actions to be dictated by them. Israel is not condemned because of what Israel does. It is condemned because of Islamic bigotry, left wing radicalism and international dhimmism converging in one place. This is a pattern that cannot be undone. It can only be ignored. When you listen to the threats and taunts of those who hate you, you give them power over yourself. If you try to accommodate your behavior to gain their favor, their outpouring of hate for you will only grow. It is not your behavior they hate, it is you. By showing weakness, you invite attack. By giving your enemies power over you, all that you accomplish is to drive them into a feeding frenzy at your vulnerability. If you go on this way, you will either be a slave or a corpse. A slave if they have any use for you alive. A corpse if they don't. Either way you have put your head into the noose they made for you. Israel cannot go on this way. No country could for long. Yet it does, marching on toward the gallows, protesting that there has been a terrible mistake here. But there is no mistake here. None at all. The executioners nod sympathetically and promise to look into it, as they bind his hands behind his back. It's a farce and everyone, except the dumbest among the lynch mob and the condemned, knows it. But like the condemned man refusing a blindfold in the anecdote who's scheduled to be executed, Israel keeps being warned not to make trouble. Go quietly. Breathe deeply. Soon it will all be over. What will the world say, if Israel resists? Exactly what the world says now. The troublemakers that are the cause of all the troubles of the otherwise peaceful nations of the Middle East. The worm in the lovely healthy apple otherwise covered with Muslim tyrannies. Every threat that has been made has come about when Israel made concessions, not because it refused to. Every time Israel has chosen the high road, its enemies have ambushed it from the low road. It's past time to wake up and start learning some lessons. The noose is drawn. And the nation is gasping for air. That breath of air was Jerusalem. The next one will be the Galilee. And then what? How many more breaths are left after that? 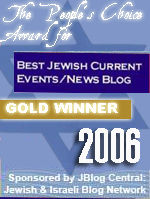 Before Oslo, Israel was threatened with terror if it did not comply. It complied and the terror increased manifold. And if did not negotiate further, it was threatened with international isolation. It negotiated. It gave. And it was isolated anyway. It was threatened with boycotts, and it gave, and the boycotts came anyway. Now they threaten the unilateral recognition of a Palestinian state. Followed by a One State Solution. Followed by international intervention. Noose, gallows and all. And does anyone think that all these will not come about anyway if Israel gives Abbas and his terrorist cronies their own official state with a capital in Jerusalem? When Israel withdrew from Gaza, allowed Hamas to control it, and did nothing but prevent Hamas from having outside access, the world howled as if Israel had filled the country with graves from end to end, as Sudan or Iran or some of the other members and former members of the UN Human Rights Commission have. Now that Israel sacrifices the lives of its soldiers to minimize Muslim civilian casualties while Hamas does everything to increase those casualties, the howling has become a din. That is not justice. That is a lynch mob. We are no longer talking about negotiations. Or any serious discussion of a state. We are talking about the world rising up in one voice to defend the rights of a genocidal organization whose charter includes the words; "The Day of Judgment will not come about until Muslims fight the Jews (killing the Jews), when the Jew will hide behind stones and trees. The stones and trees will say O Muslims, O Abdullah, there is a Jew behind me, come and kill him." The pretense is over and done with. This is not about anything resembling peace. This is about death. This is a lynch mob. Some come willingly. Others think that they have no choice. That a single murder will buy them the tolerance of the Dar Al Islam. 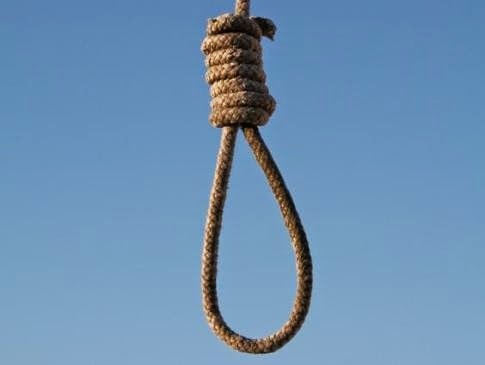 This is what a noose looks like. These are the gallows. As its hands are bound, Israel loses the ability to defend itself. As the noose tightens, Israel dies. Only by resisting the noose, can it survive. Only by fighting to free its hands, can it resist. The way of surrender is the way of death. And after Israel dies, its own hangmen will be next. The lynch mob has only begun. Its appetite is whetted by death. Its hunger will only be sharpened, not sated, by blood. And it will cover the world in blood, if it is not stopped. But now the noose draws tight. Only a little more air is left. What will Israel do with that air? 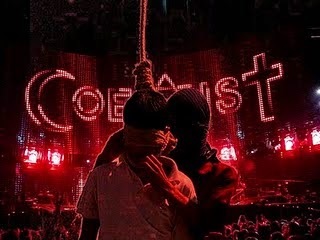 Appeal for justice, or fight with all its strength to rip the noose away. For now the choice is still hers. When the noose has done it work, it no longer will be. Excellent article. You're right about the process thing. This isn't a peace process it's a slow-kill genocide of a nation. You should go to Israel, become a MK and speak the truth to the Knesset, and Bibi. You might have to form your own party, though. The cry "death to the Jews" once again echo's in Europe's streets. Howling lynch mobs of rioting import muslims testing the state's willingness in stopping them and finding this willingness wanting which only stimulates their appetite to deploy their dominance of the streets. If no modern day Charles Martel or Vlad Tepesh rises to stop the muslim mob's conquest, Europe shall be lost. 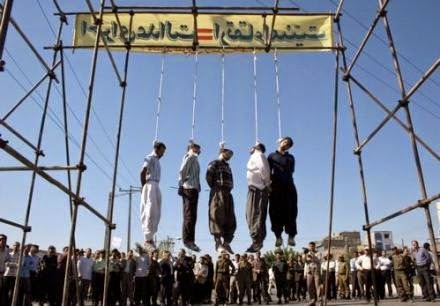 As America under Obama worked hard to lose the last shreds of it's former exceptionalism there shall be no nation left to prevent European freedom from being hung next to the Jews. Reality and truth. The things our Western liberals cannot stand. I would force every BBC and US network reporter and liberal press vulture to read your words. For the sake of us all Israel must stand even if the whole world is against her. There are many outside Israel who will also never accept the lies and it is their duty to speak out against the liars and fools. It is just. Here's to hoping we're not all doomed here. Israelis are falling to this trap again and again. Everyone under 21 has heard these lies since birth. I know Bibi is unpopular in some circles, I would still take him over Obama in a New York minute.. Despite the media's willful blindness to Islamic terrorism, Israel still has many supporters all over the world. Now that we've just given more millions to Iran, when they start playing with their new toys, watch the West come to Israel on bended knee to save them. Hermit: They most likely have heard the lies since birth, but they've also learned that these lies have done little to nothing to stop all of the kassams and katyusha rockets. IMO the kids from Sderot and southern Israel will be quite a force once they get older. Because it's a free country, Israel is moral country and therefore has a right to exist and to thrive. It is surrounded by tyrannies, religious, secular, or a mix thereof, each of which, depending on the ruling tyrant of the moment, may well be a direct threat to Israel's existence and to the lives of every Israeli. Israel has the moral right to take any action, political and military, on behalf of its survival and the lives of its people, and in so doing, should ignore the empty, meaningless howling and screeching from the Left around the world. Excellent! What America and Western Europe seems to ignore is that the 'Holocaust' of the Nazi's has now become the cry of the religious terrorist organizations, i.e. Hamas, ISIS, Hezbollah, etc., to kill Jews and in Iraq-Christians. The main stream media in America should be ashamed of itself. It does not report; it sensationalizes and editorializes. Some people have looked at the Holocaust and asked 'how did it happen'? WELL, IT IS HAPPENING NOW, AND WHAT IS BEING DONE??? mindRider, Europe is already lost, and without some common sense, the US will fall prey too. As for Israel, the Sultan is right. What is playing out now is the result of what played out before, all ended too soon by the cease-fires courtesy of the kumbaya crowd, lastly saving Hamas and Hezbollah. Netanyahu has remained steadfast to this point, and must continue to resist any deal not on Israel's terms, most importantly that Gaza be totally disarmed and stay that way. Am Yisrael Chai. Is Israel not squashing its enemies as we speak? Besides a few half hearted objections by world leaders, has their been any real pushback? Why the hyperbole Daniel? Speaking of Hezbollah, has anything been happening in northern Israel? We haven't heard too much about what's going on there lately. Re Gaza/Cast Lead 2: The IDF really shows the world what its capable of once they launch ground assaults. The iron dome and air strikes are wonderful but there's nothing like boots on the ground. That's the IDF's biggest strengths. IMO they can recapture Gaza. Save the gallows and nooses for Haman and his accomplices. I dunno. Things have changed this time. European goverments have been pretty much against Hamas in this conflict, along with Egypt and Saudi Arabia. They have looked into the abyss - Libya, Yemen, Syria, and Iraq, and they don't like what they see. Suddenly Israel is looking more and more like a welcome neighbor, rather than an enemy. Daniel,the greatest danger to the Jews are not the Arabs.The danger to Israel & the Jews are the International leftists who were born Jewish but hate Judaism.In this group of traitors,Shimon Peres,in Israel, is the last of this old guard. In the early 1920's Rabbi Jacob Maze of Moscow appealed to Leon Trotsky for help.The Jews were in need of help because of the pogroms in Russia after the Red revolution & the Rabbi hoped that Trotsky would help him! Trotsky told him he would not do anything for the Jews.He told the Rabbi that he was not a Jew,that he was an internationalist & a revolutionary Communist.He told the Rabbi that when there were no more Jews & only workers there would no longer be pogroms.Rabbi Maze replied that "The Trotskys make the revolutions & the Bronsteins (Trotsky's real name) pay the bills". In Mandated Palestine,Trotsky's more moderate little brothers,the Labor Zionists gained full control of the Jewish agency. 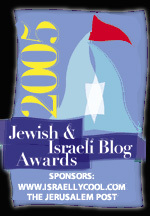 The Labor Zionists,who were statists of the western Fabian sort ,were not as extreme as the Bolsheviks.Under Ben Gurion they seized control of the basic institutions that would later run Israeli society after 1948.since that time the Labor Zionists saw themselves as transplanted European Jews who did not believe in Judaism.They believed in leftist humanism, Israeli style.They saw themselves as the " New Jews"! 66 years later their heirs still have a strangle hold on Israel society.These Fabian Socialists,as was Trotsky,are basically "internationalists" & opposed to Judaism which is particularist.Internationalists at war with Judaism inside of Israel.When these Socialists were in power they promulgated laws & policies which were antagonistic to the needs of the Jewish nation.After all,they were internationalists & global statists,hostile to the ideas of Judaic nationalism.These were the home grown Quislings,the traitors inside to gates,ready to betray the nation for the European Anti-Semites they identified with.If not for the opposition coming from these leftists Israel would not have the problems it has today.To this day the Bronsteins continue to pay the bill created by the Trotskys! "...its existence offends the religious fanaticism and prejudices of a billion Muslims, who control much of the world's oil, and whose followers are willing to riot and kill in the streets of nearly every major city in the world at the slightest offense..."
Not true. A "billion" is an awful exaggeration and destroys all hope. Muslim people are allowed to follow any fatwa, from any religious "leader", or none, at all. There is no required fatwa for all Muslims. We both know that stupid people follow charismatic leaders and do their bidding. Do you think the Muslim occupants of Gaza want Hamas to shoot missiles at Israel? They know their families are hostages, and held where they are, to protect the missile batteries from Israeli's who don't want to kill civilians. Hamas is a minority of fanatics that control Gaza residents' lives thru ruthless power. They are not popularly elected; they had their "one man, one vote, one time", and will not be easily rooted out. Most Muslims, even in the Middle East are not part of the mob, have families and a desire to survive that is greater than any animosity toward Israel they may be required to express to stay out of trouble. That makes a lot more sense than your exaggerations, which do the opposite of what you want, --inspire Jews, everywhere, to support Israel's right to live. There are not enough secular Jews in Israel. Too many Israeli's believe in "god's will" and offer their throats like sleep-walking fools. History shows them repeating the suicidal "holy" ritual, time after time, and they get what they apparently want. They wish compromise would work, this time, but know it only puts off the inevitable, yet they keep on doing it because they have suicidal genes. Crazy as that sounds, it is a demonstrated truth that can't be refuted by evidence. Suicide cures guilt every time. It's hard to inspire sheep, the fashionably popular leftist Jewish communities outside Israel, who ignore the noose of their nightmares, convincing themselves it's not for them. Israeli's have to understand it is not a "billion" Muslims, but a few power-hungry fanatics who temporarily control a small number of animals in that world, who do not represent the people. The leaders can be eliminated, easily, by people with courage and conviction. It's not hopeless, as you really present it. It's simple and easy, but world media opinion has to be ignored. People always support the underdog, if he fights. Find and hang the Hamas leaders; the rest will figure it out. Exactly right from beginning to end! Brilliant! When are the Jews going to realize that no matter what the Israelis/Jews do the overwhelming majority of the world is either going to hate us or at best be indifferent towards us. What will it take for us to do whatever is necessary for us to survive and not to care what those who hate us think about what we do to survive? Would any other nation ask permission to defend itself? And then be appologetic for doing so? "I dunno. Things have changed this time. European goverments have been pretty much against Hamas in this conflict, along with Egypt and Saudi Arabia. They have looked into the abyss - Libya, Yemen, Syria, and Iraq, and they don't like what they see. Suddenly Israel is looking more and more like a welcome neighbor, rather than an enemy." Can't say that I blame them. Gaza/Hamas is a train wreck right now. Probably the same reason Jordan doesn't appear to be in any big hurry to repatriate the Palestinians. To the idiot Sven. Isn't it about time that Israel do what it should have done long ago and it is to stop listening to the UN predators and beat the living daylights out of the palastinians or whatever the predators call themselves. Excellent analysis, Daniel -- no, BEYOND excellent. Linking to it from my blog. Thanks for your clarity and truth. And yet every single European member of the UN Human Rights Council chose to abstain rather than oppose a resolution targeting Israel and calling for an investigation of Israel's alleged crimes. There was no comparable condemnation of Hamas.